You’re out of the playoffs, your season is over and there’s little left to do but wait for this agonizing year to end and then find some way, any way, to endure another off-season of boasts from the coach in your league who has won it all. God forbid if he (or she) has won in back-to-back years! What is really left to be done? We’ve all lived through it and we all know the answer. You don’t need to be a seasoned dynasty player to understand what comes next. In fact, in all likelihood, you’re already engrossed in preparation for 2018. Hey, give yourself credit, you’re here, reading this now – putting in the work. Or, you’re hopelessly addicted to football. Either way, we understand you and are here for you. When it all comes down to it, only one team can win in a given year and it takes a special blend of skillful roster construction, match-up management during the season and a lot of luck. There’s simply no way to remove luck from the game, nor would we want to. But, those that do their homework earn a greater amount of luck. Whether that truly is or is not the case, I choose to believe it is. DLF members expect coverage that gives them get a leg up, an advantage and an edge for winning. The NFL season is, believe it or not, our low-period for activity. Things begin picking up in December as dynasty players, mostly super-fans, begin the process of building for next year. Trades, draft research, free agency and waiver wire additions all play important roles in the building of a dynasty team. Heck, many of us play dynasty not just for the challenge, but also as an excuse to stay immersed in the game year-round. I don’t blame a single one of you. DLF exists for this same reason – for you! Many of you have followed me for close to a decade. You know that my calling card is draft research. I don’t use group-think or others’ work to determine my rankings or thoughts on a player or players. Sure, I use all resources toward helping fill the pool so to speak and generate initial assessments, but that is when my work really begins. Being a draft/player analyst means that you’re going to have amazing hits and epic misses. I’m accountable to every one. I’m not afraid to go against the grain and be the lone wolf sounding the alarm on a high profile player (Trent Richardson, Eddie Lacy, Doug Martin and Johnny Manziel) or stand alone in singing the praises of under-the-radar players (Dak Prescott, Alex Collins, Greg Jennings and Jimmy Graham). And, of course, I learn from every miss (David Johnson, RGIII, James Starks and Michael Thomas). My first entry to the 2018 class can be found here. It’s my quick overview of the incoming group and a very basic top-ten. Now we go deeper, beginning with the running backs. As is always the case, my rankings and thoughts on players will change as I watch more tape, not just highlights. You can’t judge how a running back pass protects from a highlight tape, nor can you necessarily assess his hands. Most of all, you can’t rate character, leadership or intangibles from watching a video review of his top plays. For those things, an analyst much go much, much deeper. You must watch the boring videos, the “touch-tape”, as I call them, that goes well beyond just highlights. Lastly, you don’t need to spend huge sums of money, read hundreds of pages or climb the tallest mountains in Tibet to find the best information. If we thought that is what it takes to give you an advantage, we’d be doing just that. What you need, more than anything, are trusted resources. We know from the work we put in that DLF is just that, a trusted resource. You hold us to a higher standard and expect greater accuracy, and we’re very happy to attempt to clear that bar each and every year. But there are many good analysts out there. Find ones that earn your trust! I’ve read the longest guides and the shortest and I can tell you with great confidence that volume does not equal quality, nor does price. Passion and good ol’ research are what we offer you and what we believe you should seek in others. Let’s get cookin’ here and have some fun as we begin to march our way to NFL draft declaration day, the NFL Combine and, finally, the NFL Draft. I just don’t need to spend much time on highlighting Barkley’s game or how he projects to the NFL. I’m as excited about him at the next level as I was Adrian Peterson and Todd Gurley. He’s got a thick and wide base with a low center of gravity. Very agile for his size with a devastating jump-cut and angular burst off a head-fake, especially to his right. He runs with patience and and is a a tackle-breaking machine. Combine those qualities with excellent patience behind the line of scrimmage, sneaky-fast acceleration once he squares his shoulders to a hole, adept hands out of the backfield and a passable grade on pass protection and the only mystery left will be how high he goes in the draft and to who. He’s certain to be a top-seven selection. Barkley will remain alone in my first tier and I’ll be surprised to see his name at 1.02 in any fantasy draft in 2018. He’s that good. Great read and series Jeff, thanks for keeping us busy during the “off season”. You know that’s how we roll. The off-season is our on-season! Awesome article. Curious to know why you kept RoJo off your top 10 overall list but have him listed here as the number 4 overall back. I’m not willing to add someone to my list without seeing enough tape to rank/assess them appropriately. As it’s a very early look, I’m not over concerned about making sure every player is represented. Sometimes I will add a list of players after the top-ten so that readers know that I haven’t forgotten them. I should have done that this time but didn’t. Good stuff. Thanks for taking the time to produce good content. As you mentioned in the opening paragraph, we (as dynasty aficionados) are insatiable. I’m anxious to read Part 2 of the 2018 running back report when you include names like Kerryon Johnson, Mark Walton, Kalen Ballage, and Akrum Wadley. Thanks Matthew! It’s a labor of love but it’s also a lot of work. I’m excited to do the work beyond the top 10 into some of those names, especially Ballage and Wadley. That’s where it starts getting interesting. Glad you liked it Logan, much appreciated. Great read Jeff, love your research and analysis. Whenever I see one of your articles I always give it extra attention because I place a lot of trust in your opinions so I’m pleased to see that we share the same top 4 guys at the moment. No greater praise V and I appreciate it. There’s a lot of misinformation out there and a VAST majority of the people out there calling themselves analysts hop on bandwagons and parrot what they’re hearing elsewhere. Anyone can do that but it takes far more courage to go against the masses with names like Eddie Lacy, Trent Richards, Doug Martin, Ameer Abdullah. Of course I’ve had my misses, too. I thought David Johnson was a poor man’s James Starks, a player I LOVED out of Buffalo. Donald Brown broke my heart too. It comes with the territory. My specialty is fantasy third round receivers though! Anyway … thanks for the comment. Jeff – can you share some of your 3rd round WR successes? Is this a list that includes Cooper Kupp?!! Ah yes … Cooper Kupp was one of them but I was adding him in not only the third round, but also the end of the second round if my team didn’t have an early third round success. Greg Jennings was a nice third round addition as was Marvin Jones. Devin Funchess is still developing but he was an early third rounder as well for me. Typically I look for size vs. production coming out of a major conference … or size vs. crazy workout numbers into a NFL situation with a veteran quarterback with depth chart unrest. I’ll be highlighting some of these shortly after the draft. Curious to see where LJ Scott ends up. Had a tough year but man did he make an impression last year. He’s on my list. I watched some tape and wasn’t overly impressed but when I go beyond my top 10 into the next 10, I’ll be watching more tape of him. Is it just me, or does Barkley make everyone else look pedestrian? It’s not just you. He’s one of those players I won’t even do a big write up on … don’t need to. It’s almost like Luck at QB, Gurley or Peterson when they came out. To me it is so cut and dried for those players. Fournette would have been in that boat if not for injury issues and concerns . And I still have those concerns yet I took him everywhere I could at 1.01 and I traded a lot of stuff for him. As a new DLF member and tied for last in my first dynasty, this is exactly the kind of content I’m looking for to prepare me for next year. 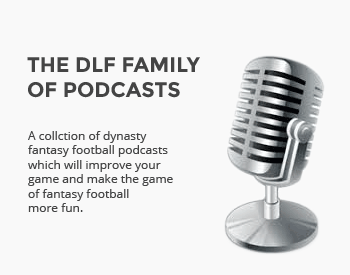 I’m looking forward to following DLF this off season and start turning my team around. Welcome aboard Mitchell. We love the off-season and that’s what we’re known for. You’ll see others release special guides, and one-off reports and while we do that on occasion as well, we don’t charge extra for it. Guides are nice but the day you buy them, they go out of date VERY quickly. We much prefer to have ongoing and live content and then update it as much as possible. You’ll love the off-season here. Especially when we get into March/April as we prepare for the draft. Feb. is fun to as we got close to the Combine. Any thoughts on Mike Weber? He split carries with Dobbins this year, but averaged over 6 ypc and looked pretty talented the few times I got to see him. Funny you mention Weber. I just saw a bit of tape on him but not enough to form a real opinion yet. He’s the type of back that I want to see vs. (vs. other schools) tapes over highlight tapes so I can see his good and bad touches.